The attraction of the Mountain Goats is the sheer intensity of John Darnielle's vocalizing and playing. His vocals, throughout every album, have been delivered with such conviction and power that no matter what the content of the lyrics were, you had to listen. 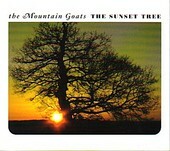 With each album, Darnielle has improved his lyrical writing and subject matter until it has finally reached a pinnacle with The Sunset Tree. Finally, there's a Mountain Goats album with everything equal in its intensity. The extremely personal lyrical subject matter of The Sunset Tree finally fits together with Darnielle's singing and playing. It's like finding that first jigsaw piece that fits perfectly and starts you on the journey of finishing the puzzle. This is the album that made the New Yorker call Darnielle: "America's Best Lyricist." "Dedicated to any young men and women anywhere who live with people who abuse them, with the following good news: You are going to make it out of there alive You will live to tell your story Never lose hope"